There’s always been something lovable about UAVs. Especially the armed ones, like the MQ-9 Reaper. I don’t think I’m alone here. I get great satisfaction from reading about our unmanned strikes in Pakistan and Afghanistan. While their commanders desperately need to do a better job of avoiding civilian deaths, unmanned aircraft are the future of aerial warfare, and the Pentagon knows it. They are nearly doubling the budgets in 2011 for the Reaper and its smaller sibling the MQ-1 Predator. 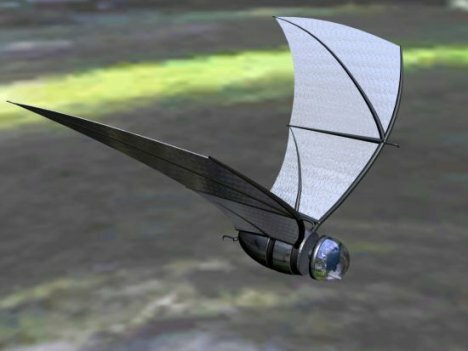 They gave a ten million dollar grant to develop the COM-BAT, a 6″ long mechanical spy bat that is designed to harvest some of its power from the sun, air flow, and its own kinetic energy. There are reports of hummingbird sized UAVs employed by special forces units for around-the-block surveillance. The Pentagon really gets it. One thing that the Pentagon is perpetually clueless about, however, is cyber warfare. For all of the money that they spend on signal intelligence, sometimes it seems like they’re still fighting the cold-war. This is another such case. In an effort to keep the price tag low on UAV models, encryption was never built into their video feeds. This came to the attention of the US military when in the summer of 2009, they confiscated some insurgent laptops which contained long stretches of drone footage. A measly 30$ piece of software and a digital satellite TV tuner is all it takes for a militant to download drown feeds day and night. While thankfully they weren’t smart enough to design software to take control of the drones, evidence suggests that insurgents have snooped on drones for years. This is sure to be a contributing factor in the abysmal 10% hit rate on the intended targets of drone strikes in Pakistan in 2009. That’s not to say they didn’t hit people (708 people were killed in those attacks), but rather that they mostly hit the wrong people – 90% civilians. What’s perhaps worst of all, is that the Pentagon knew about this vulnerability since the Bosnian War in the early 1990’s. They didn’t consider it a hole worth patching because it was deemed too technically advanced to be exploited by the low-budget enemies on the ground. Apparently, no one at the Pentagon steals satellite (this is mostly done by low-budget types). The Pentagon is rapidly trying to retrofit the in-theater UAVs to transmit encrypted video communications, but it has taken nearly a year to get most of them done. Considering the collateral loss of life that year encapsulates, it makes the omission of encryption that much more shameful. ~ by Wil Finley on February 8, 2010.